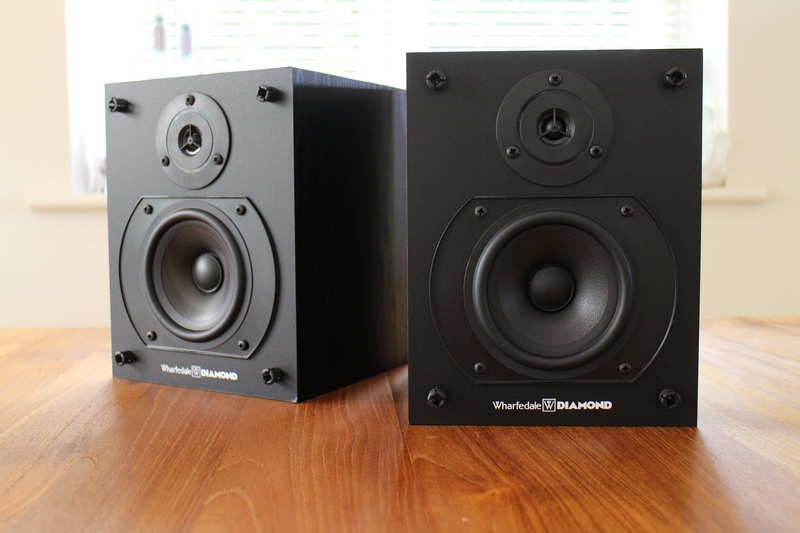 The first Wharfedale Diamond was famously said to be derived from research undertaken for the company’s high end TSR102 project, but in truth it was simply its treble and midrange unit in a tiny, bespoke bass reflex box. The result was a loudspeaker in miniature, with just 5.2 litres of internal volume to play with. Into this went a 19mm Audax plastic dome tweeter and Wharfedale’s own 120mm long throw mid/bass driver, sporting a (then fairly advanced) polypropylene cone. Built on a rigid steel frame, it wasn’t a bad unit and gave the Diamond a fighting chance of producing a nice noise. Cabinets were thin 12mm chipboard complete with the compulsory wood effect vinyl wrap. A ducted port, 30mm long and 65mm wide, fired out of the rear panel to give the Diamond a semblance of efficiency. In true eighties audiophile tradition, the crossover was just two elements plus a resistor to bring the tweeter level down. Lest we forget, five years previous, no self respecting loudspeaker went without a hopelessly complex, multi-element affair that sapped more power than an oven on Christmas morning. On the back were very modest binding posts. There was a choice of ‘wood effect’ vinyl or black vinyl wrap finishes, as with almost every other budget box of this period. The result was a dinky little loudspeaker, just 240x185x205mm, which worked with amplifiers between 15 and 50W and had a relatively benign impedance of (nominally) 6 ohms. Sensitivity was just 86dB, meaning its 50W maximum input power was never going to sound very loud, but then again if you wanted disco power you would buy JBLs. Neither was bass anything to write home about – by around 75Hz it had gone! Hardly a startling set of statistics then, so why was the Diamond ever conceived? The answer came when you listened to a pair – for under £80 you got a pair of loudspeakers that took you to the heart of the music. In many hi-fi respects they were appalling – bass was notable by its absence and treble extension and clarity poor – but in the musicality stakes they were corkers. That polypropylene mid/bass unit was clean enough to give you a window on the music that you just had to peer through. The Diamonds really capitalised on their design strengths – small cabinets meant a fast, tight sound with little overhang, and those tiny drivers made for near point-source imaging. Wharfedale started changing the Diamond practically from the day of its launch back in 1984. A year later the more balanced, sober sounding Diamond IIs came out, and thus followed the Super Diamonds complete with stronger, real wood cabinets and veneer, for nearly twice the price. The following Active Diamonds were a good idea before its time – there were few audio sources back then with line level audio outputs, but now there are millions. A series of new Diamonds followed, each less focused but better all rounders than the originals. Buy the Is or IIs for around £50 depending on condition, and you’ll have got yourself some eighties design classics. Simple fun.